Heat oven to 350°F. Spray six 6-oz. custard cups with nonstick cooking spray. In small bowl, combine sugar and 1/4 teaspoon cinnamon; mix well. Place 1 pastry sheet on work surface; spray with nonstick cooking spray. Sprinkle with 1/4 of sugar mixture. Top with second pastry sheet. Spray with cooking spray; sprinkle with 1/4 of sugar mixture. With sharp knife, carefully cut pastry sheets into 12 (4x4 1/4-inch) rectangles. Place 1 pastry rectangle into 1 sprayed custard cup so that one corner of rectangle covers bottom of custard cup and remaining corners extend above edge of cup. Add 3 more rectangles, turning each one slightly so extended corners do not overlap. Repeat with remaining pastry rectangles to make 2 more phyllo cups. Repeat process with remaining 2 pastry sheets and cinnamon-sugar mixture, making 3 additional phyllo cups. Place custard cups on cookie sheet. Bake at 350°F. for 8 to 10 minutes or until crisp and golden brown. Cool 5 minutes. Carefully remove pastry cups from custard cups. Just before serving, in small microwave-safe bowl, combine honey and 1/2 teaspoon cinnamon; mix well. Microwave on HIGH for 30 to 60 seconds or until warm, stirring once halfway through cooking. To serve, spoon 1/2 cup sorbet into each shell. Drizzle each serving with warm honey mixture; sprinkle with walnuts. Garnish each serving with strawberry fan. Baklava, a classic Greek dessert, is phyllo pastry layered with butter, walnuts and cinnamon and soaked in spiced citrus sugar syrup. 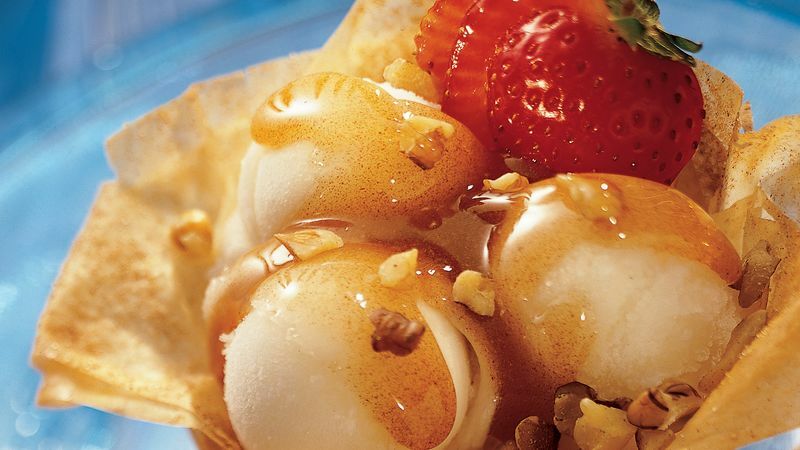 Those flavors inspired this low-fat dessert for our menu. Use your favorite sorbet or other frozen dessert in place of the lemon sorbet. Butter-flavored cooking spray can be used in place of the regular spray. When working with phyllo dough, be sure to keep the unused portion of the dough covered with a slightly damp towel or plastic wrap to prevent it from drying out.